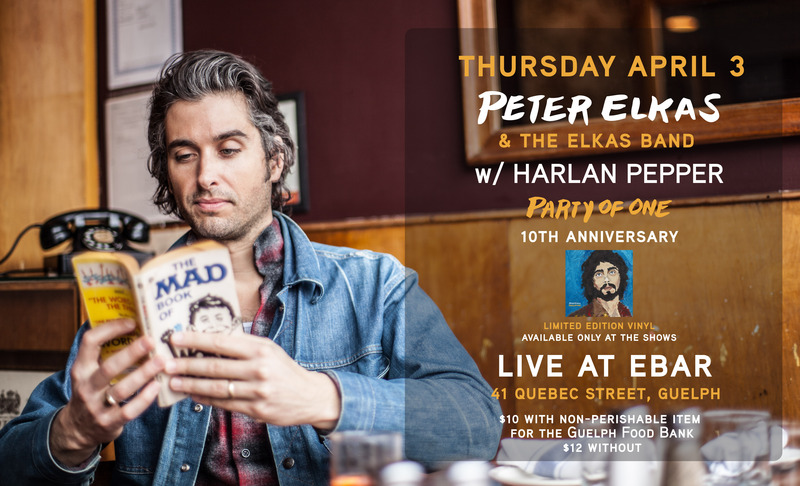 KYEO is pleased to announce that excellent Toronto-based rock/soul singer, songwriter, musician, dog walker, and dad Peter Elkas returns to Guelph for a show at the Ebar in Guelph. Harlan Pepper, a wonderful roots-y ensemble from Hamilton with a connection to the Royal City and a new album out this month, join the bill opening for Elkas and his band. This all-ages concert takes place at the Ebar on Thursday April 3, 2014 with doors opening at 9:30 PM. It will cost $10 with a non-perishable donation for the Guelph Food Bank and $12 without and tickets will only be available at the door. Harlan Pepper will be on at 10 PM, Elkas and his band will be on by 11 PM. Elkas is marking the 10th anniversary of his celebrated solo debut, Party Of One, with a limited vinyl pressing of the LP and an April residency at The Dakota Tavern in Toronto. The string of shows kicks off on April 1st with Elkas performing the album in its entirety with the original session musicians, Don Kerr (Ron Sexsmith) and Doug Friesen (Bidiniband, John K Samson). Elkas is also performing dates throughout Ontario for the rest of the month, including a Light Of Day benefit concert at the Molson Canadian Studio in Hamilton Place on April 12th with the Sam Roberts Band. Light of Day Canada is committed to raising money through various events that support research and care for Parkinson’s victims and families. Elkas is a coordinator and board member of the organization and has had the good fortune to not only play annual events in New Jersey, but also jam with Bruce Springsteen. Party Of One was released in 2004 after Elkas’ previous act, the Local Rabbits, went on “indefinite hiatus.” Expanding upon his songwriting in that band, he kicked against the zeitgeist by crafting soulful pop and rock songs that are AM radio-accessible. Party Of One was produced by Kerr and found Elkas straddling a line between experimental sounds and more traditional songcraft. The last time Elkas was in Guelph, he headlined a successful month-long residency at the Ebar in support of his most recent LP, 2011’s Repeat Offender. We’re thrilled to have him back. Harlan Pepper released their new album, Take Out a Twenty and Live Life to the Fullest on March 11, 2014 via Six Shooter Records. The band has been busy warming up the new material at Toronto’s Cameron House every Tuesday night in March. Take Out a Twenty and Live Life to the Fullest is full of sweet grooves, lyrical nonchalance and strong musicianship. From their Steeltown stronghold, Harlan Pepper is quietly fashioning themselves into a rock solid band of considerable depth and ability. We had some of them here in Guelph for a spell, while they pursued their studies. As their Guelph fans can attest, it’s great to have them back in town with a new record.